MADE IN USA- Motion activated real time video is recorded on a tiny SD card, housed in a hidden compartment. This high quality dual alarm clock radio for iPad, iPhone and iPod that lets you charge your iPad, iPhone or iPod and lets you wake and sleep to either one, to a custom playlist, or to FM radio. Charge and play via flexible Lightning dock or USB port (with your own cable). The auto sync feature syncs the clock to your iPhone in moments. Also includes 6 FM presets,All recording are time/date stamped for professional security applications. Every system includes a 32Gb SD card. Records color video by day, and B&W video at night EVEN IN TOTAL DARKNESS, thanks to our hidden array of totally invisible "no glow" IR Illuminators. Very covert! No "Tell Tale" SD Cards glaring out the back or suspicious looking out of place jacks. Out Total Covert line looks exactly as it does when it comes out of the factory box! – Totally hidden SD card compartment requires special secret procedure to access. Motion activated real time Full High Definition (1080P) video. 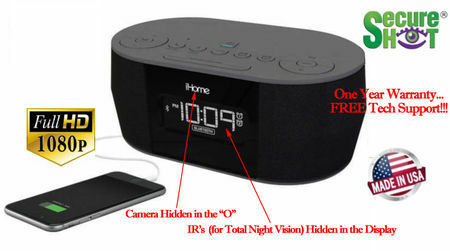 All functions of Ihome Ipod dock work normally. Video may be played back from the unit itself to your TV or SD card removed and played on your PC with included SD USB card reader. IR remote control allows for arm/disarm, system parameter adjustments, and playback. Includes:covert camcorder, remote control, 32Gb SD card, SD card reader, RCA playback cable, instruction manual. One year warranty free lifetime tech support.